“Catherine of Siena moved in remarkably wide circles for a woman of fourteenth century Italy, ” writes Dr. Suzanne Noffke (see Catherine of Sienna). “She was a mystic whose plunge into God plunged her deep into the affairs of society, Church, and the souls of all who came under her influence. 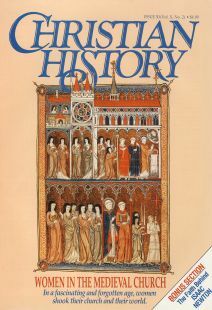 ” Catherine wrote her most important work, The Dialogue, from 1377 to 1378, about two years before her death at age 33. In it, Catherine directs questions and prayers to God, and then reflects on God’s response. The book was one of the first books printed in Italy, Germany, Spain, and England. A soul rises up, restless with tremendous desire for God’s honor and the salvation of souls. . . . Now this soul’s will was to know and follow truth more courageously. So she addressed four petitions to the most high and eternal Father, holding up her desire for herself first of all-for she knew that she could be of no service to her neighbors in teaching or example or prayer without first doing herself the service of attaining and possessing virtue. Her first petition, therefore, was for herself. The second was for the reform of holy Church. The third was for the whole world in general, and in particular for the peace of Christians who are rebelling against holy Church with great disrespect and persecution. In her fourth petition she asked divine providence to supply in general and in particular for a certain case which had arisen. [It is not known what situation Catherine refers to here.] . . .
[In this section Catherine writes what she perceives to be God’s message to her.] You will find humility in the knowledge of yourself when you see that even your own existence comes not from yourself but from Me, for I loved you before you came into being. And in my unspeakable love for you I willed to create you anew in grace. So I washed you and made you a new creation in the blood that my only begotten Son poured out with such burning love. . . . It is your duty to love your neighbor as your own self (Mk. 12:33). In love you ought to help them spiritually with prayer and counsel, and assist them spiritually and materially in their need —at least with your good will if you have nothing else. If you do not love me, you do not love your neighbors, nor will you help those you do not love. . . . Every help you give them ought to come from the affection you bear them for love of me. . . . I tell you, moreoever, when you return good for evil you not only prove your own virtue, but often you send out coals ablaze with charity that will melt hatred and bitterness from the heart and mind of the wrathful, even turning their hatred to benevolence. Such is the power of charity and perfect patience in one who takes up the burden of the sins of the wicked and bears with their anger (Rom. 12:17–21). The Book of Margery Kempe is the earliest known autobiography in English, yet it was lost for centuries until rediscovered in 1934. Margery was born in England in about 1373, and she lived a full and turbulent life for sixty-odd years. She was married and bore fourteen children, but her heart was in the pursuit of holiness, which in her day involved religious pilgrimages. She traveled by herself to the Holy Land, Assisi, Rome and many other places. She was criticized for her active life (“Woman, give up this life that you lead, and go and spin, and card wool, as other women do”) as well as for her frequent sobbing or shrieking during prayer. Her life reveals the simple and devout faith of a medieval Christian. And so she gave her message as she was commanded, and the vicar still kept his cure. . . .
And so he lived for many years afterwards in good health and prosperity. . . . These are written to show the homely intimacy and goodness of our merciful Lord Christ Jesus, and not to commend this creature. One person that Margery Kempe visited was Julian, a Christian woman in Norwich, England. Julian (c. 1342–after 1413) was an anchoress, meaning she spent her life in prayer, perpetually enclosed in a small room. In her case, the room was attached to the outside walls of St. Julian’s Church in Norwich. In May 1373 Julian fell sick and was near death; she recovered, however, and received sixteen visions. These are described in her book Showings, or The Sixteen Revelations of Divine Love. This revelation was made to a simple, unlettered creature, living in this mortal flesh, the year of our Lord one thousand, three hundred and seventy—three, on the thirteenth day of May. . . . Our Lord opened my spiritual eyes, and showed me my soul in the midst of my heart. I saw my soul as wide as if it were a kingdom. . . . In the midst of this city sits our Lord Jesus, true God and true man, a handsome person and tall, honourable, the greatest lord. And I saw him splendidly clad in honours. He sits erect there in the soul, in peace and rest, and he rules and he guards heaven and earth and everything that is. . . . The place which Jesus takes in our soul he will nevermore vacate, for in us is his home of homes, and it is the greatest delight for him to dwell there. . . . And when I had this with great attention, our Lord very humbly revealed words to me, without voice and without opening of lips, as he had done before, and said very seriously: Know it well, it was no hallucination which you saw today, but accept and believe it and hold firmly to it, and you will not be overcome. . . .
And these words: You will not be overcome, were said very insistently and strongly, for certainty and strength against every tribulation which may come. He did not say: You will not be assailed, you will not be belaboured, you will not be disquieted, but he said: You will not be overcome. God wants us to pay attention to his words, and always to be strong in our certainty, in well-being and in woe, for he loves us and delights in us, and so he wishes us to love him and delight in him and trust greatly in him, and all will be well. And soon afterwards all was hidden, and I saw no more. How Did Hildegard Receive Her Visions? Today, the name Hildegard of Bingen is little known, but in Hildegard’s day, few Christians were more influential. Hildegard (1098–1179) was founder and first abbess of the Benedictine community of Bingen, Germany. She was also a visionary and prophet who called the church to reform. She advised the emperor Frederick Barbarossa, traveled, preached, and wrote extensively. Hildegard’s best-known work, The Scivias, was published in 1151 after ten years of work. The book consists of twenty-six visions, somewhat similar to those described in the biblical books of Daniel, Ezekiel, or Revelation. Reprinted here is Hildegard’s description of how these visions came to her, followed by her first vision. It happened that, in the eleven hundred and forty—first year of the Incarnation of the Son of God, Jesus Christ, when I was forty—two years and seven months old, Heaven was opened and a fiery light of exceeding brilliance came and permeated my whole brain, and inflamed my whole heart and my whole breast, not like a burning but like a warming flame, as the sun warms anything its rays touch. And immediately I knew the meaning of the exposition of the Scriptures, namely the Psalter, the Gospel and the other . . . volumes of both the Old and the New Testaments, though I did not have the interpretation of the words of their texts or the division of the syllables or the knowledge of cases or tenses. But I had sensed in myself wonderfully the power and mystery of secret and admirable visions from my childhood—that is, from the age of 5-up to that time, as I do now. This, however, I showed to no one except a few religious persons who were living in the same manner as I; but meanwhile, until the time when God by His grace wished it to be manifested, I concealed it in quiet silence. But the visions I saw I did not perceive in dreams, or sleep, or delirium, or by the eyes of the body, or by the ears of the outer self, or in hidden places; but I received them while awake and seeing with a pure mind and the eyes and ears of the inner self, in open places, as God willed it. How this might be is hard for mortal flesh to understand. I saw a great mountain of iron, and enthroned on it One of such great glory that it blinded my sight. On each side of him there extended a soft shadow, like a wing of wondrous breadth and length. Before him, at the foot of the mountain, stood an image full of eyes on all sides, in which, because of those eyes, I could discern no human form. In front of this image stood another, a child wearing a tunic of subdued color but white shoes, upon whose head such glory descended from the One enthroned upon that mountain that I could not look at its face. But from the One who sat enthroned upon that mountain many living sparks sprang forth, which flew very sweetly around the images. Also, I perceived in this mountain many little windows, in which appeared human heads, some of subdued colors and some white. Resources for women in the medieval church. He has been called “the greatest scientific genius the world has known.” Yet he spent less time on science than on theology. Newton’s faith in his own words. Chronology of Isaac Newton’ life and times.